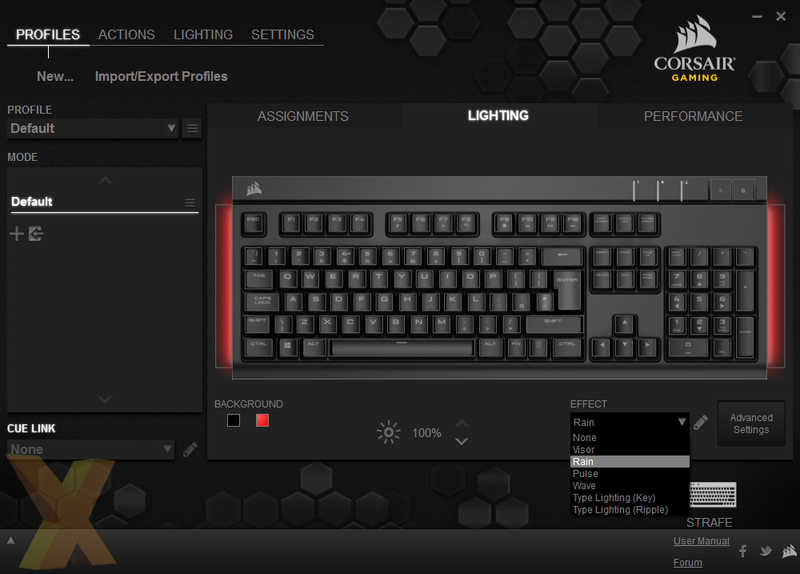 Like most advanced gaming peripherals these days a companion software package is needed to perform many of the tweaks and customisation options on offer, for the Strafe this functionality is delivered by the Corsair Utility Engine (CUE). The CUE software package has been tidied up a bit since the release of the K70 RGB late last year. 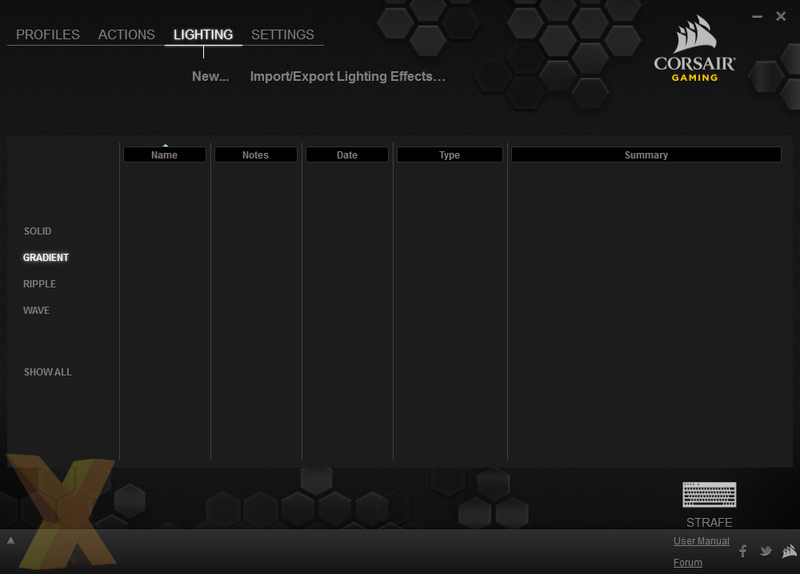 Perhaps the most welcome change is that the lighting section now includes a basic set of options that don't require any advanced knowledge, users can select between six fancy lighting modes without any difficulty. 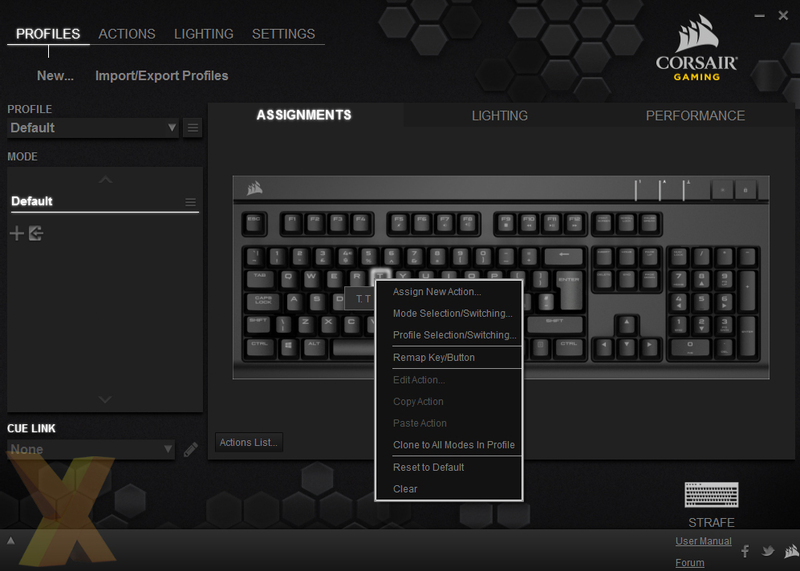 For users feeling brave enough to tackle the complexity of the custom per-key lighting, profiles can be created manually in the advanced sections of the software. Those with less interest in such technical endeavours can stick to basic options or import profiles made by other people. 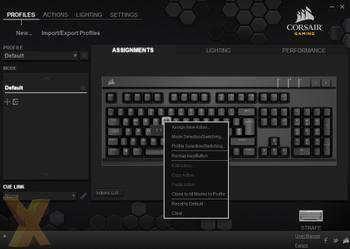 At present Corsair's RGB Share service for distributing CUE keyboard lighting files is, as the name might suggest, limited to its RGB keyboard lines only. There is currently no download area where Strafe owners can retrieve and share lighting profiles, we'd like to see Corsair provide one but understand that without RGB support the customisation options are decidedly more limited. 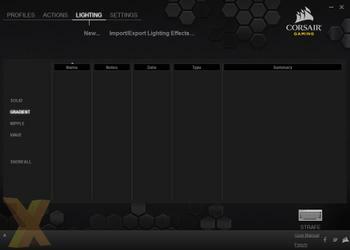 For the time being Strafe owners can share lighting profiles on the appropriate section of the Corsair forums. 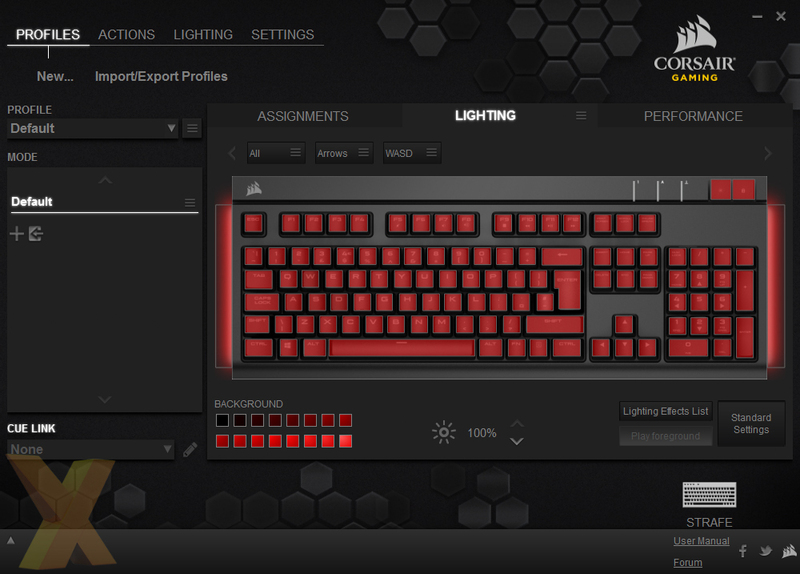 Corsair touts the Strafe as having macros on all keys, something that is technically true given that the CUE software allows users to reassign or map any key to just about any other key or function. The problem with such a strategy is that users need to sacrifice a standard keyboard key in order to get a macro in return, such as some of the lesser used F-keys, rather than use a dedicated macro key. Alternatively, the dedicated Windows Lock key or brightness adjust keys could also be repurposed for macro buttons. We'd like to see blank or macro key caps to allow users to take lesser-used keys, such as the lower F-keys or the numpad, and visually designate them as macros. 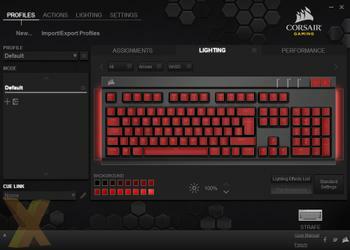 ...Corsair's Strafe provides an excellent pathway into the world of mechanical gaming keyboards. Corsair Strafe has a retail price of $110 in the USA and £100 here in the UK, making it the company's lowest-cost full-sized mechanical keyboard. Despite the cost reduction there's still plenty on offer with the Strafe that positions it far from an entry-level keyboard. Some of the more impressive features for the price point include per-key macro and lighting customisation, a USB pass-through port, dedicated brightness, Windows lock key and swappable key caps for FPS/MOBA gamers. Not to mention the blissful typing experience of Cherry MX Brown or Red switches, though MX Blue fans will have to wait until later in the year for availability. The Strafe does drop a few features compared to the K70 RGB, such as RGB lighting customisation, a wrist-rest and dedicated media keys but it also comes in with a more aggressive price point. The decision to transition the construction materials from anodised aluminium to plastic can be seen as a cost-saving measure but in practice the material downgrade does little to detract from the overall design. The Strafe is reinforced with a steel plate that makes it feel sturdy enough and it weighs more than Corsair's aluminium counterparts. Having witnessed the real-world wear and tear of a Corsair Vengeance K90 keyboard over a two-year period, it's also worth mentioning that plastic handles dirt and finger oils a lot better over the long term than anodised aluminium. Corsair's Strafe provides an excellent pathway into the world of mechanical gaming keyboards with all the appropriate design elements sufficiently covered. The Strafe may not be as feature-packed as Vengeance RGB models but PC users interested in something a bit simpler will appreciate the Strafe's more affordable price point. 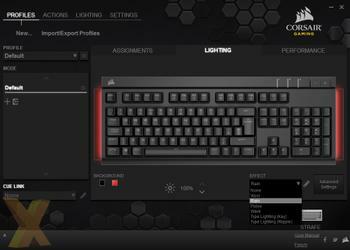 The Corsair Strafe mechanical gaming keyboard is available to purchase from Scan Computers. Looks OK, but think I'd rather go for the Func and save the money tbh. The logo complaint is legit. People spending 3 figures on a keyboard usually have a colour scheme in mind, and a bright yellow logo hardly fits most colour schemes. I would definitely not have bought a K70 with the yellow logo. It's not just the colour of the logo, its the horrific trampy design. Looked like a prostitutes tattoo. The classic sails logo is a really clean and classy logo. It's beyond me why they did it in the first place. For a good no frills option, the Steelseries 6V2 is non too shabby, OK no frills or LED lighting but a good heavy duty keyboard.